of the National Health Service. what to do about Syria. in the tranquillity of Twitter. You will not be able to discover it from your sofa, brother. because my resolution will not be televised. My resolution will not be tweeted. concerning animal cruelty and the release date of his latest film. My resolution will not be televised. My resolution will not be Facebooked. set against the backdrop of a soaring mountain or a mirror-blue lake. I have saved, how many drinks I have not drunk. of kale soup and black bean-quinoa salad. My resolution will not be vlogged. about my brand new range of eyebrow pencils. There will be no pictures on Instagram. on DVD, Blu Ray, CD-Rom, VHS or Betamax, brother. My resolution will not be prerecorded or livestreamed, sister. and exhibited in a Museum of Modern Art to critical acclaim. My resolution will not survive more than two days. 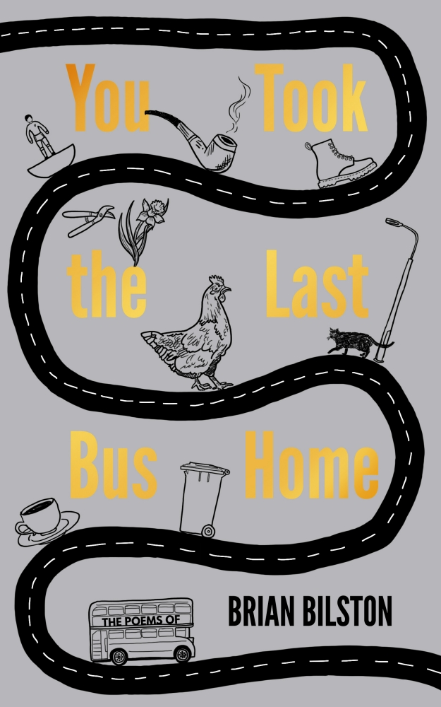 I’m pleased to say that my poetry collection You Took the Last Bus Home has now published and is available through bookshops and online stores in both print and ebook formats. If you’re interested in buying a copy, do seek out your local bookshop – or Hive is an excellent online alternative, as it allows independent bookshops to benefit, thus enabling the book industry as a whole to continue to thrive. It will publish in the US in January. If you’d like to read more about how I went from posting poems in tweets and blog postings to publishing a book, you can read about it here in a piece I’ve recently written for The Irish Times. it passed me by first time around. I have to read ten thousand tweets. but I’ve reached a new level on Candy Crush Saga. a cat upon one’s lap does limit one so. but I’ve never been much good at society. to join his professional network. with the concept of rejection. who I have never met. that you can include on your profile page. greeting PowerPoint with such fond embrace. O Mighty Strategist! Leader Complete! The Pivot-fabled Slayer of Spreadsheets! and just ten miles from the charming, bustling city of Marbella. obstacle courses of lampposts and cones. For we shall stare at mobile phones. with the dusty rebuke of neglected tomes. feelings once said, lie buried, unknown. when we’re together and when we’re alone. into the pit with our crumbling bones. So that we might stare at mobile phones. with who he really was.